‘Jack Thomas effect’ for Joe Fitzpatrick at Mansfield Town? 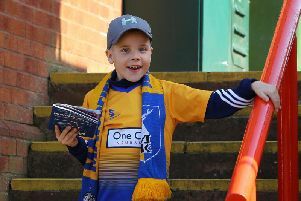 Young Mansfield Town midfielder Joe Fitzpatrick’s loan spell at Carlton Town is going very well – and boss Adam Murray hopes it will have the desired ‘Jack Thomas effect’ when he returns. Fitzpatrick made three appearances for the Stags’ first team last season, and had a one month loan spell at Sutton Coldfield earlier this season. The 18-year-old is at Carlton until 2nd January, and Murray said: “It is an absolute blessing in disguise. “With the amount of ability he’s got we need to make sure we get the best out of him. “He’s gone out there and got man of the match in two games so that will be a major step in his development.